Life has been so hectic recently. We didn’t get started on Thanksgiving crafts until last night. 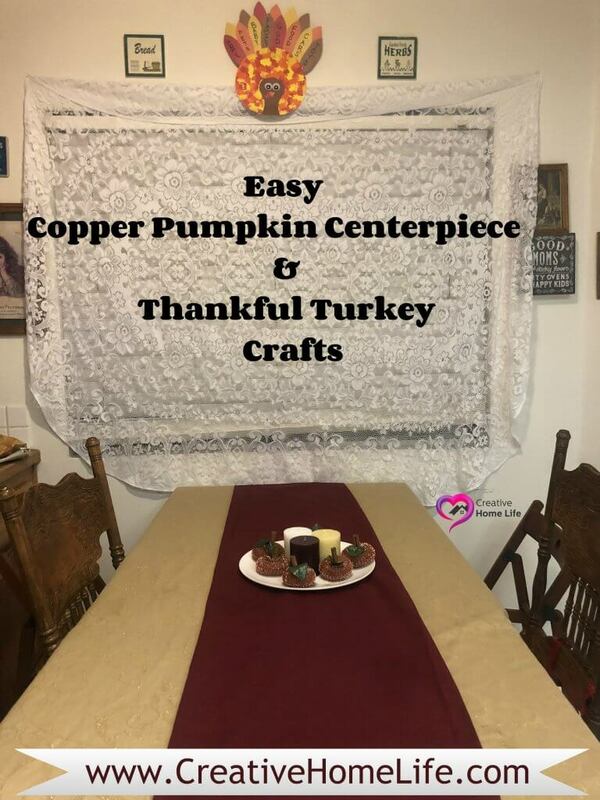 I came up with this cute easy Thankful Turkey Craft, that we didn’t end up finishing until tonight. Didn’t he turn out cute?! With Thanksgiving approaching my 4-year-old daughter and I have been discussing being Thankful. After finishing this craft, I asked her, “remember how we have been talking about being thankful and grateful for what we have?”. I told her we are going to write the things she is most grateful for on the feathers on top of her turkey. She had Mommy tearing up with her sweet and mature above her years’ responses. She told me, in this order. She is such an amazing little girl, she blows me away every day! I am so grateful and blessed to be her Mommy! Start out by cutting your sponge into three strips. I poured the paint into three separate bowls with a sponge slice in each bowl. Have your child dab the sponge into the paint and then dab onto the paper plate. Alternating the colors until the plate is covered. Allow to dry. Meanwhile…. Cut a body for the turkey from the brown paper. Cut out feathers, beak and the Turkey’s gobble. Glue the body to the bottom of the paper plate. (I used hot glue). Glue The feathers on the back of the plate, I used white glue and hot glue as well, to attach the feathers. Hot glue the googly eyes, use white glue to attach the beak and gobble to the turkey’s body. 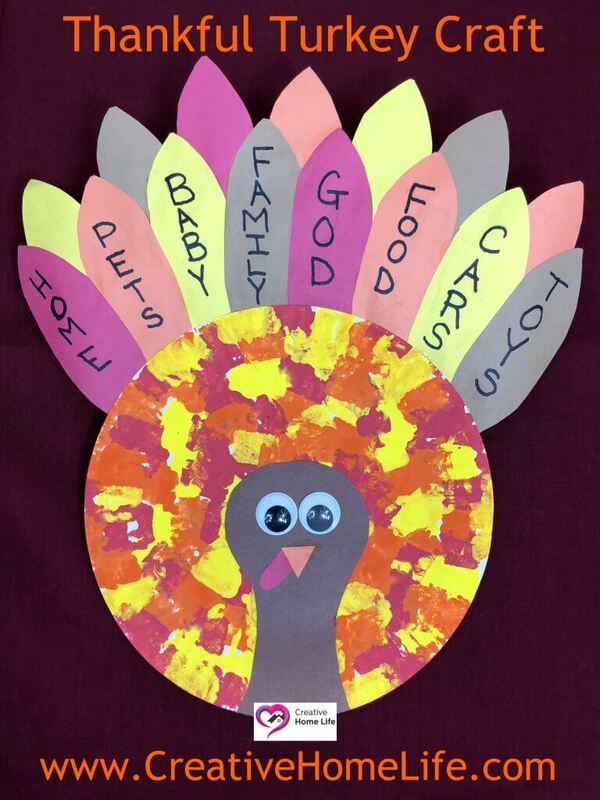 Talk to your child about being Thankful, and ask them what they are thankful for. Write their responses on the feathers. On the back attach a pipe cleaner. I bent it to shape and taped it into place, to make sure it was centered when hung. When I was happy with the positioning I used hot glue to attach it securely. 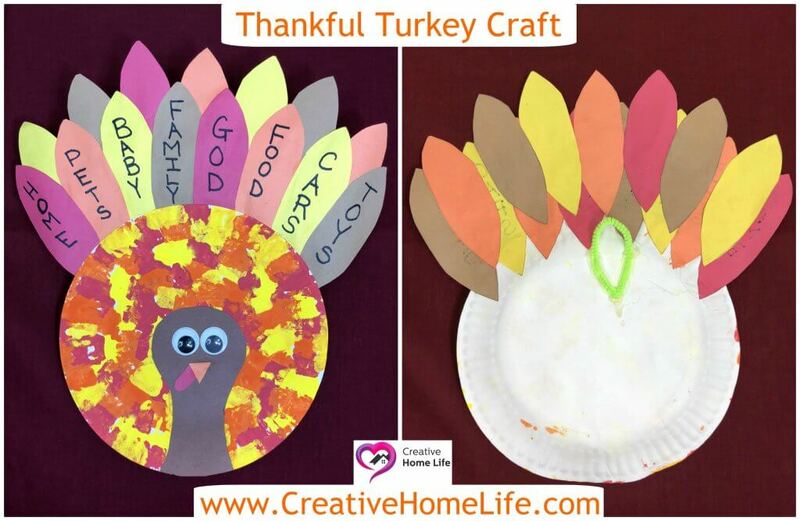 If you have any questions about our “Thankful Turkey” craft, or anything else… Please feel free to message me or leave a comment.